In large bowl, mix artichoke hearts, bell pepper, tomatoes, onion, olives, garlic, capers, honey and red pepper flakes. Divide evenly among sheets of foil. Place packs on grill over medium heat. Cover grill; cook 6 minutes. Rotate packs 1/2 turn; cook 4 to 6 minutes longer or until vegetables are tender. Remove packs from grill; cut large X across top of each pack. Carefully fold back foil, and garnish with mozzarella and basil. Drizzle with balsamic vinegar. To make in oven, place packs on cookie sheet. Bake at 375°F 15 to 20 minutes or until vegetables are tender. Carefully fold back foil, and garnish with mozzarella and basil. Drizzle with balsamic vinegar. 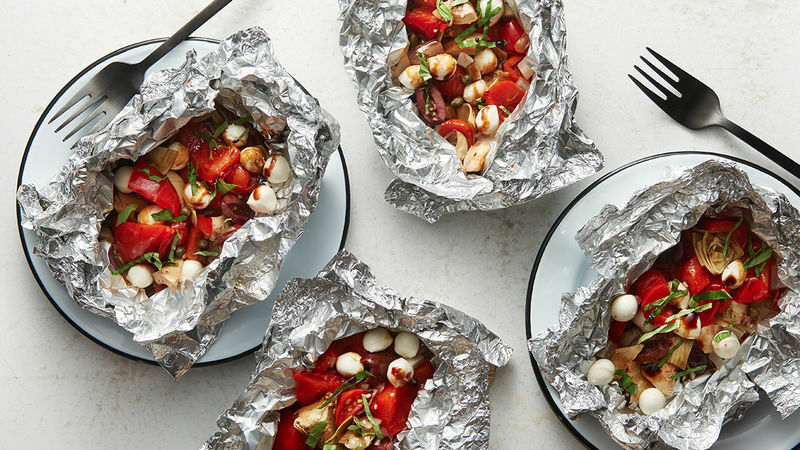 These foil packs also make a great appetizer. Just throw some sliced ciabatta or baguette on the grill beside them for fun do-it-yourself bruschetta. For the prettiest presentation, cut tomatoes in half through the stem so it’s less noticeable.